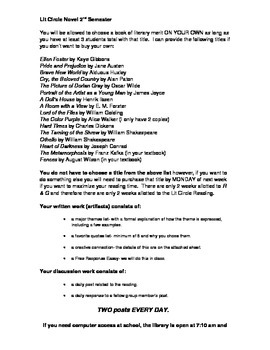 This is the actual Literature Circle Project assignment that I use in my Advanced Placement class in the 2nd Semester. It is not a traditional "roles" based Lit Circle. It includes a list of titles that I offer which of course, you will want to alter to suit your own collections. It also includes a rubric. The elements of my Lit Circle project are: Favorite Passages, Themes, Creative Connection Project, Free Response Essay, and an Online Forum Discussion requirement. If you do not currently use a website or blog, you can easily adjust the plan to a face-to-face discussion requirement or omit that element altogether. I alter my Lit Circle Projects from semester to semester, year to year. This particular assignment yielded some wonderful projects and the online discussion boards were impressive to read. My students participate in these circles toward the end of our year so they are able to do some very complex work on their own by using these guidelines! I hope this Melanie Hazen TPT Product is successful in your classroom as well!